by Dan Emicus: With another dominant performance over a formidable adversary last night, Deontay Wilder (25-0, 25 KO’s) has taken another step towards cementing a great legacy which will transcend the sport itself. Just kidding, I shall leave generous praise to a certain someone on this writing team who rates Wilder highly and is an avid believer in the prospect’s potential. Wilder is worthy of attention, of that there is no doubt, but it is difficult to assess his progress when he isn’t being matched responsibly. There are those who insist that his performances to date warrant giving him the benefit of the doubt, but I for one prefer to give a prospect his due on the basis of merit, as opposed to speculation based purely on how impressive he looks against a vastly overmatched opponent. In his last outing against Damon McCreary, a one-time Super-Middleweight prospect 11 years ago, we learned that someone who once competed several weight divisions below heavyweight will struggle insurmountably against Wilder’s power. Well, we already knew that. In fact, we have had about a dozen reminders of this already throughout Wilder’s career thus far. To Wilder’s credit and also in his defence, he took this particular fight on 7 day’s notice, but that doesn’t excuse the fact that this type of contest is not an exception for a Wilder fight – it’s the norm. As the least experienced boxer at the Beijing Olympics 2008, it was a remarkable achievement for Deontay Wilder to come away with a Bronze medal, but what do we know about him after 4½ years as a professional? In short, precious little can be said with any degree of certainty, such is the low level of opposition that he has been matched with. Indeed, despite all 25 of his wins coming inside the scheduled distance, it can’t even be presumed that he’s as devastating a puncher as his record would initially suggest. After all, it’s not as if his opponents haven’t been knocked out early by other boxers, both before and after they became a victim of Wilder’s. To put it bluntly, Wilder is yet to KO anyone who has a semblance of durability to speak of. To his credit, he stepped up a few levels against Owen Beck, [29-10 – 20 KOs], a contender a decade ago, but a mere trial horse nowadays who finds himself matched against heavyweight prospects that need a name on their records. Unlike for most of his fights, Wilder was content to patiently probe from the onset, showing understandable caution against an opponent once widely regarded as a KO artist much earlier in his career. In his most significant test to date, Wilder’s performance was a mature one, looking to control range against his plodding adversary and he even seemed comfortable on the backfoot during the fleeting moments when Beck looked as though he might mount a meaningful offense. 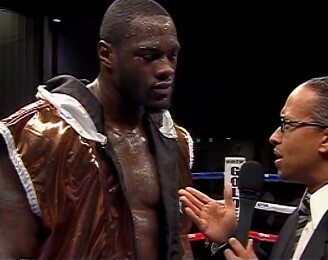 In outclassing his man, Wilder may have convinced many observers that he will be effective as a boxer-puncher at a higher level, but it is difficult to gauge this in proportion to what Beck offers as an opponent in 2012. What isn’t debatable is that Wilder will have taken much more from this fight than from his other 24 wins combined. It’s a step in the right direction and he needs more opponents who offer something noteworthy, even if only a past reputation. The problem is that opponents such as Beck should have been met much sooner. To prove this point, 6 months prior to his fight with Wilder, Owen Beck had actually lost to Sergey Rozhnov, a Russian debutant. Was this a case of the Russian’s team being extremely brave and/or wreckless, or is this evidence of Wilder’s team being extremely cautious in handpicking opponents? It is the prerogative of Wilder’s team if they want to take their time, but it certainly can’t be said that Wilder’s learning curve has been either steady or gradual. There are those who draw attention to his impressive record as evidence to the contrary, but it’s not quite as impressive if you consider the fact that he is the first heavyweight since Faruq Saleem to go 25-0 without meeting a top 100 heavyweight, and we all know what happened to Mr. Saleem. During the early stages of a genuine heavyweight prospect’s career, he is typically matched with an assortment of opponents. Tall guys, skilled smaller guys, durable journeymen who give rounds, a southpaw, a few ‘names’, and a couple of tests against opponents who are only slightly overmatched. In contrast, it would seem furthering Wilder’s KO streak has taking precedence over Wilder’s development as a prospect. This incites suspicion, no least because of the names that have been called out throughout. We are led to believe that Wilder would go from KOing tomato cans, to suddenly being ready to fight Eddie Chambers or Tomasz Adamek – if only they would accept and not “duck” him. It doesn’t matter that Wilder lacks rounds, has had no learning fights and is still green. Yeah, right. Despite having 25 fights to his name, we are yet to see if Wilder has the stamina to go more than 4 rounds, or how he will cope against an opponent who’s at least relatively elusive and has the ability to hit back. Indeed, what happens when Wilder is in a fight where he takes punches? Harold Sconiers [17-20-2] somehow managed to score a knockdown against him, leaving Wilder visibly shaken and seemingly fortunate to make it to the end of the 2nd round in their encounter. Of course, Wilder went on to win that bout via TKO4, but it’s still not a good indication, particularly as it’s the only one that we currently have. As an old boxing cliché goes, you can only beat what’s put in front of you. What happens when a top 50 heavyweight is put in front of Wilder? For the betterment of the heavyweight division, I truly hope he disproves all such scrutiny and cynicism. After all, we are in dire need of charismatic and talented individuals to revive interest in the division once the Klitschko brothers move on. Wilder has undoubtedly demonstrated a good and varied repertoire of punches in his arsenal, as well as solid power at the very least with both hands whenever he hasn’t been too preoccupied with showboating. His jab has looked authoritative at times, and despite standing at 6’7″, he has shown a willingness to work inside against shorter fighters. His handspeed and lateral movement are excellent, and his conditioning is as good it gets for a heavyweight. By virtue of his physical attributes alone, he is surely ready for a legitimate test and there are plenty of ex-contenders in the US who’d be more than willing to provide one. It’s only then that we will know whether or not Wilder has the potential to challenge for a world title at some point in the future. The likes of Monte Barret, Maurice Harris, Jason Estrada, Tye Fields, and Travis Walker are all willing to give a prospect a workout. Why not be bold and give them a call? « Ricky Hatton close to announcing comeback!